Let me start off by saying that I use almost every Google product, tool, and service available on the web. I drank the Google Juice Cool-aid years ago. It’s hard to imagine that anything like “THIS” could ever happen to someone, and especially to this extreme. Chris Brogan posted an article on his Blog titled “When Google Owns You” and I have to admit, I was taken back and shocked when I read his post. Sorry, your account has been disabled. [?] That’s It! As a subscriber to the comment thread on Chris’s post, I have to tell you that it is quite alarming to see how many others are or have experienced similar scenarios with their Google accounts. When I say Google accounts, that means everything you use provided by Google! I received these very words from Google too, but it was only regarding my Adsense account. No reason, no explanation, not even a real person to contact or to answer any questions. No help, no human being, and no one to provide any customer support or care whatsoever. Just “BAM” shut me down! It’s been over a year now and I’ve let it go, but everyday in the back of my mind it still bothers and somewhat haunts me. So what about you? Does Google own you? Could this happen to you? How can you answer that if it just happens to people randomly or for no reason at all? What’s worse and even more alarming is that there’s really not much you can do about it? Hmm… got you thinking now doesn’t it? Have you become reliant and dependent on the Google products, tools, and services as much as some of us have? Do you fear this could happen to you? If so, what would you do? Is this at all disturbing to you? Can you sleep well at night? Will you sleep well after reading this and Chris’s post and the comments? My apologies for being the deliverer of information that may have affected your peace of mind. Even though Google shocked me with disabling my Google Adsense account, I do still continue to use their products. WHY? They are a powerhouse with some amazing tools that still help my business as well as those I try to help on a daily basis. I just wish I could give folks a little bit more security, comfort, and peace of mind knowing that this would never happen to any of us as long as we play by the rules… but I can’t. 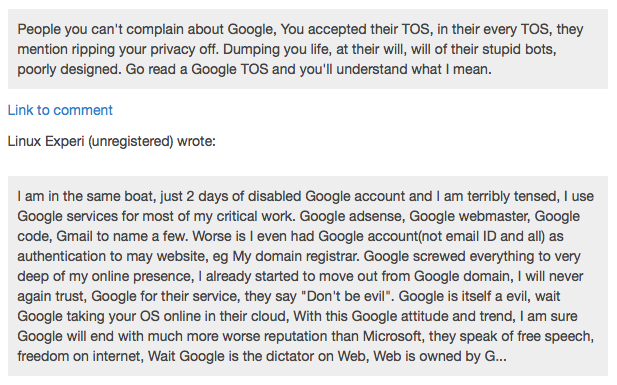 So Does Google Really Own You? 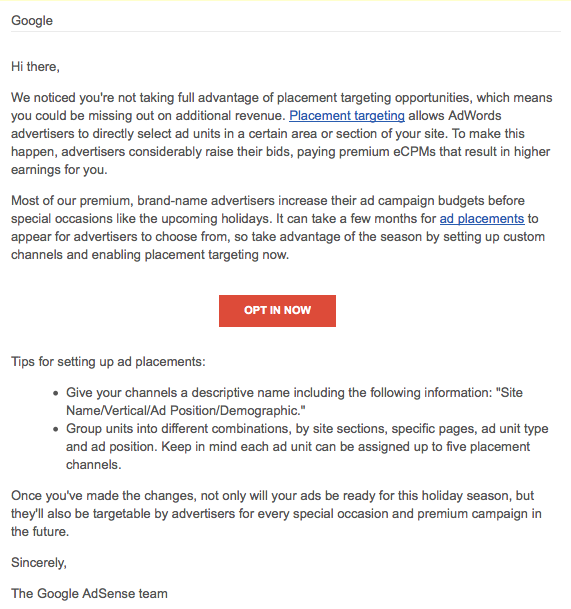 Google – if you do read this, I realize I’m taking a big risk here, but on the other side of that coin is the potential that you might restore my Google adsense account (like you have others). I have always played by the rules, supported and stood behind your products and services, and even promoted advertizing with your site to my clients and friends. I’m sure it’s a long shot and far fetched chance that you’ll even find or read this, but just in case you’ve created a special spider or bot to find articles like these, I’ll go ahead and keep my fingers crossed. This email came in from Google today and I got really excited! However, when I clicked on the “opt in” link, it still showed my account disabled! 🙁 Now Google is either spamming me or just teasing me because they can… C’mon guys!! Great article, makes me pause and consider all the power we grant to them with our tech dependencies. And that’s funny about Google teasing you 2 weeks after with the adsense email.